We're off to the Dominican Republic for some beach and baseball. Anyone else going someplace fun? Leave a comment. We hope everyone has a safe and wonderful Spring Break! 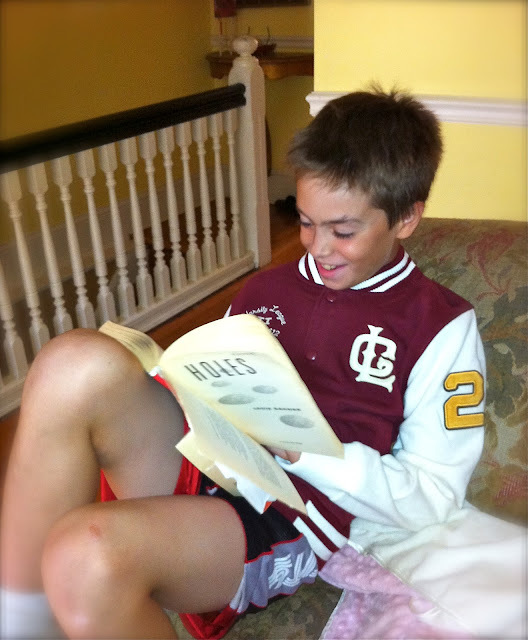 Not just for high school and college athletes anymore, the Varsity or Letterman Jacket is making a comeback! I spotted this one last fall at H & M and had to get it for Mr. C since it already had his monogram. It was made for him! But this classic is still showing up on the runways and celebrities (Rihanna seen here!) are rocking them out. I think these sporty jackets are here to stay. Fortunately, the style has trickled down for the youngsters too. The jackets look very smart when paired with vintage washed jeans or a flirty skirt for girls. Plus they make the perfect layer for this temperamental in-between Spring weather. 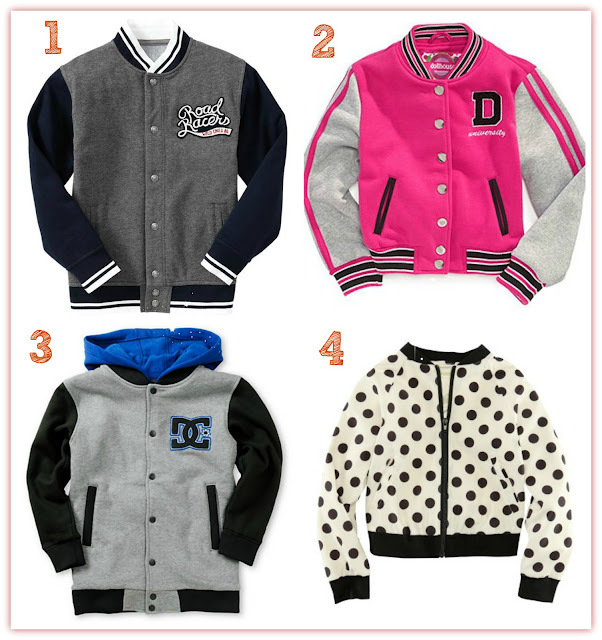 Here are a few choices for your lil' prepsters. They will be too cool for school! Tired of the constant battles and tearful pleas during bath time brushing? Always late for school due to tangled hair tantrums? Here comes the Knot Genie to the rescue! Believe me, I was skeptical in the beginning. But after testing out this detangling brush for the past two weeks, I can attest that it is pretty awesome. No more fussing, whining, or fighting! Made for all hair types, it can be used wet or dry. Although the company recommends not using it on curly hair that is dry, I still use it on Ms. T's curly mop in the mornings. I just make sure to liberally apply detangling spray. 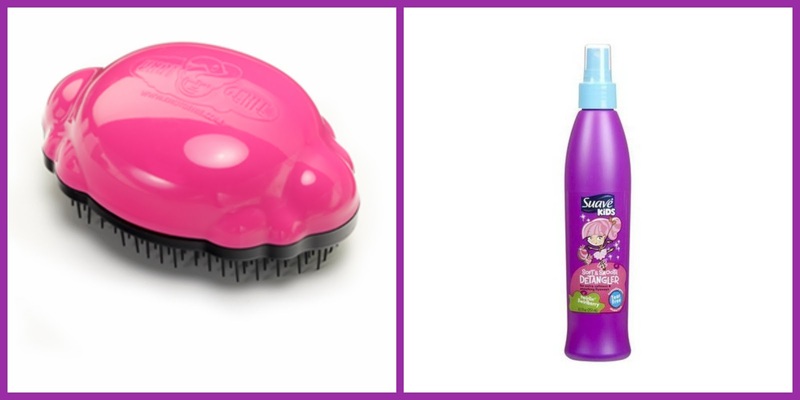 And speaking of detangling sprays, we have tried the gamut from five and dime to fancy salon products and we keep coming back to Suave Kids Twirlin' Swirlberry Detangler. It works quickly, smells pretty and doesn't weigh down Ms. T's hair. And since we use it at least once a day, you can't beat the bargain price. I have picked it up for as little as $1.98 at Target on a recent trip. You can even buy it in pack of 6 at Amazon (here). You can purchase the Knot Genie locally at The Purple Goose or online. I promise you it is well worth it. Brushing is now a breeze. Are there other kid beauty products that your family can't live without? Tell us in the comments section! Pack your bags and head for the shore! This is all your little mermaid will need for a fabulous Spring Break. Everything is from Garnet Hill Kids. Adorable Isobella & Chloe Floral Tutu Tankini. Pirouettes optional. She won't get caught with the sun in her eyes with this Straw Beach Hat. I'm digging these adorable Collapsible Buckets. 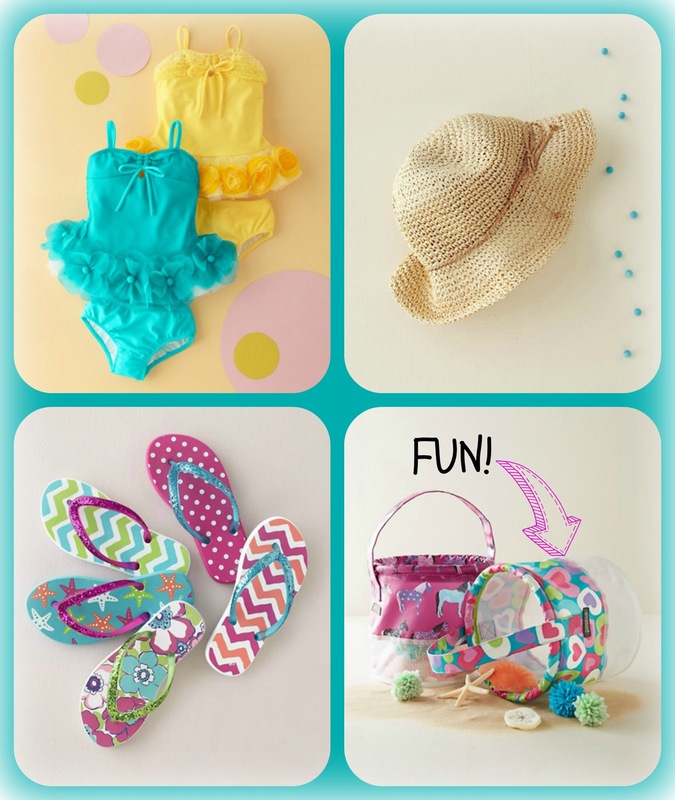 Perfect for collecting seashells or storing buried treasures. Lastly, you can never go wrong with sequins poolside! Bright and sparkly Rafters Surfer's Flip-Flops accent any bathing beauty's attire. Cute with sundresses too. Sun, sea and beach, here we come. p.s. Sunscreen. Don't leave home without it! 1.H & M Butterfly Dress - Only $9.95!, 2. Gap Kids Belted Drop-waist Dress, 3. Baby Gap Bunny Sundress, 4. Pippa & Julie Sequin Dress, 5. Zunie Lace Bodice Dress, 6. 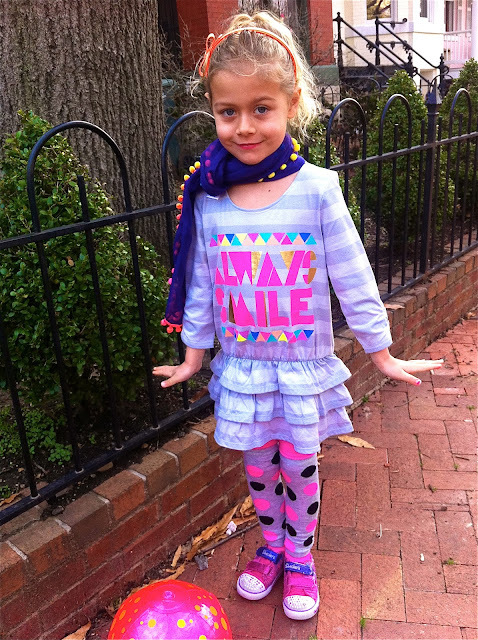 Crewcuts Colorblock Bubble Dress in Lavender-Minty Green, 7. Pippa & Julie Lace Dress & Bloomers, 8. Gap Kids Tulle-trim Eyelet Dress in Blue (also available in sassy pink & lime green). 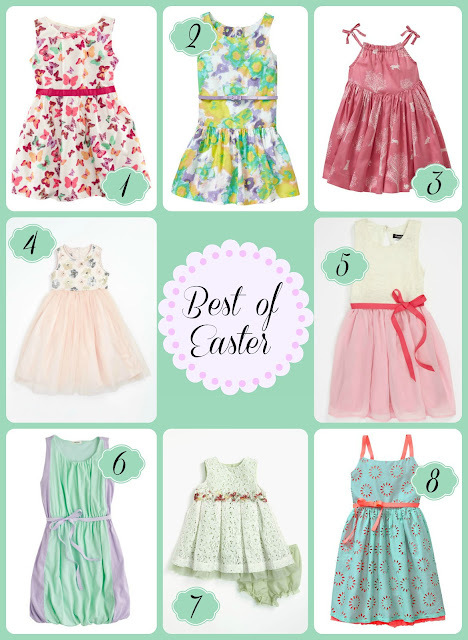 Celebrate the first day of spring with this fresh collection of Easter dresses. Butterflies, floral and bunny prints mix with lace, eyelet and ribbon belting. So, so pretty and hard to choose just one. Lucky for you, they all are priced under $50! Neon colors, so bright and trendy this spring season (and last). They are colors that I'm not usually drawn to. However, while browsing the clearance racks at Target this week, this adorable tunic top caught my eye. 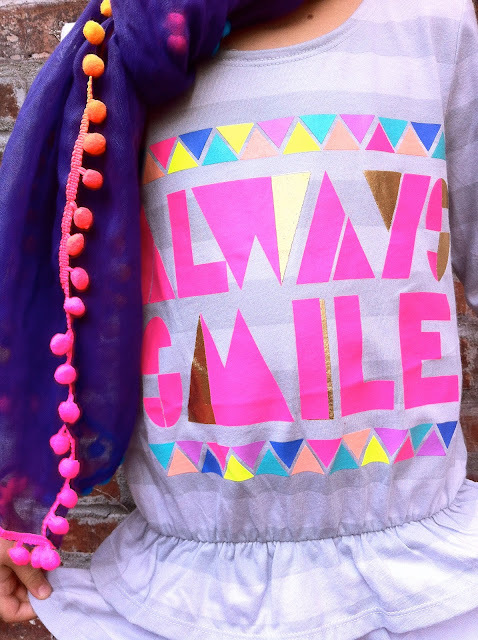 First off, I love the saying "Always Smile". It's so Ms. T. Secondly, I think the mellow combination of neon with grey makes it easier on the eye; it's the right amount of pop without being too blinding. And, of course, I could not pass up on the playful scarf with neon Pom Pom fringe for only $7.99! Especially after I recently discovered a scarf in Ms. T's school bag that she said she was "borrowing". 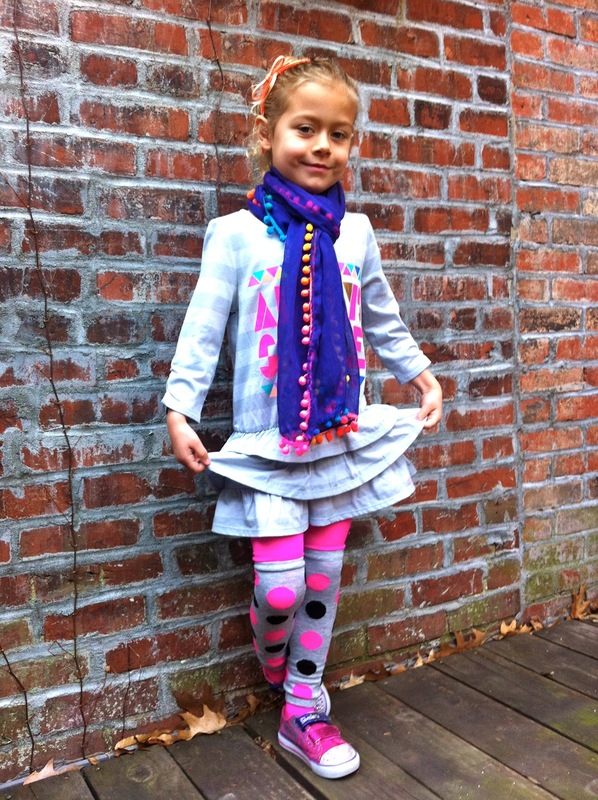 The best part is that this entire outfit (minus the shoes and headband) cost me less than 20 buckaroos! Actually, $16.45 to be exact. This ensemble has given me a change of heart. I'm loving the neon pops of color especially when paired with a neutral, like the grey above. Here are a few more fun and vibrant pieces to add some pop to your little darling's wardrobe. I think I may need to find the maxi dress in my size! 1. Crewcuts Girls' Bow Tank in Neon Clover, 2. Paper Doll Colorblock Maxi, 3. Crewcuts Girls' Mila Ballet Flats in Chambray, 4. Old Navy Neon Trim Cardi. Nothing quite says Spring like fresh pedicures and pretty sandals! 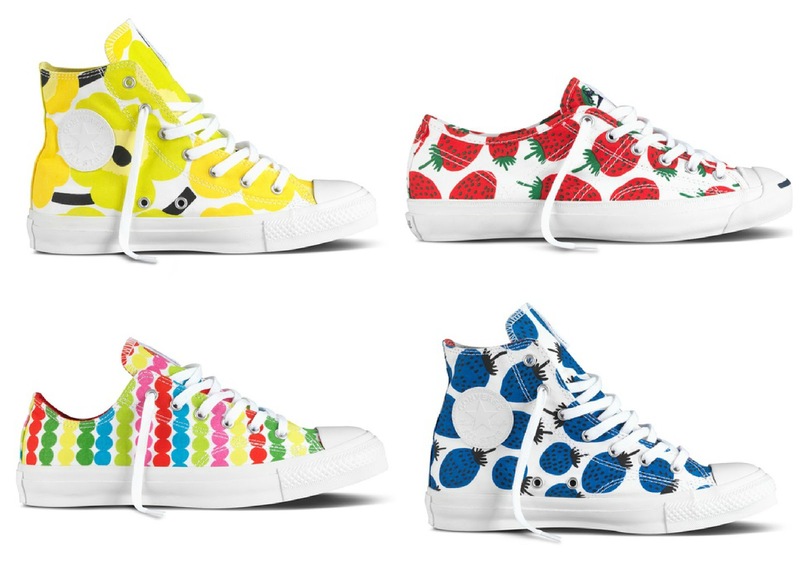 Debuting this month for spring, Marimekko's new bold and bright collection for Converse! Inspired by some of their more iconic 1960's prints, these patterns are just as fitting for this season's trends of blooms and polka dots. And strawberries have never been so stylish! The collection is available at select Marimikko stores, online here and at Converse. Sadly, the sneakers are only available in Women sizes. But, hey, "big girls" just wanna have fun too! 1. Crewcuts Girls' Polka Dot Bikini in Sweet Lemon, 2. Old Navy Tulle Rosette Flip Flops, 3. Piggy Paint Nail Polish in Dandelion Dance, 4. Gap Kids Neon Eyelet Dress, 5. My Michele Flower Belted Dress, 6. Old Navy Lace Tee, 7. Crewcuts Tippy-Toe Tulle Skirt in Citrus Sorbet, 8. Stride Rite Wakely Sandals, 9. Old Navy Butterfly Sundress, 10. Gap Kids Neon Sunglasses, 11. Crewcuts Peony Headband, 12. Crewcuts Eyelet Ballet Flats in Bright Kiwi (Ridiculously expensive but, oh so, darling! Will need to wait for a sale). On this slushy day in DC, I'm dreaming of Springtime. 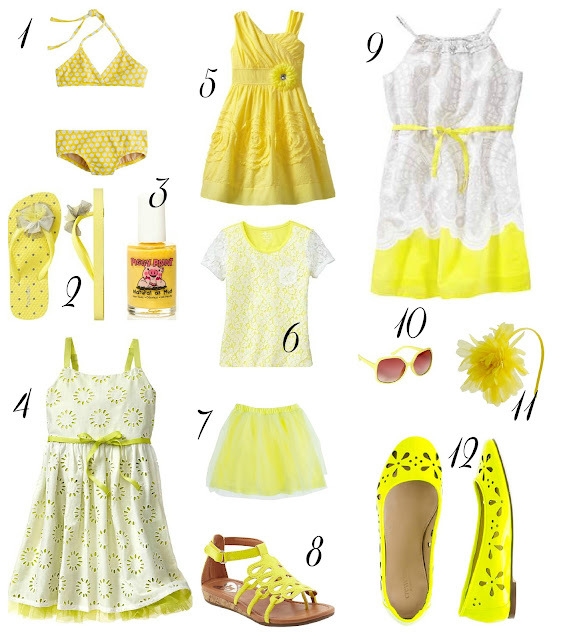 Yellow is such a happy color. Think baby chicks (Peeps! ), daffodils, and, of course, sunshine. Here is a radiant dozen to brighten up your day! What is your favorite color to welcome in Spring? Leave a comment. Yesterday it was my other baby's birthday. The Notorious P.U.G., Mr. Buster, turned ONE! 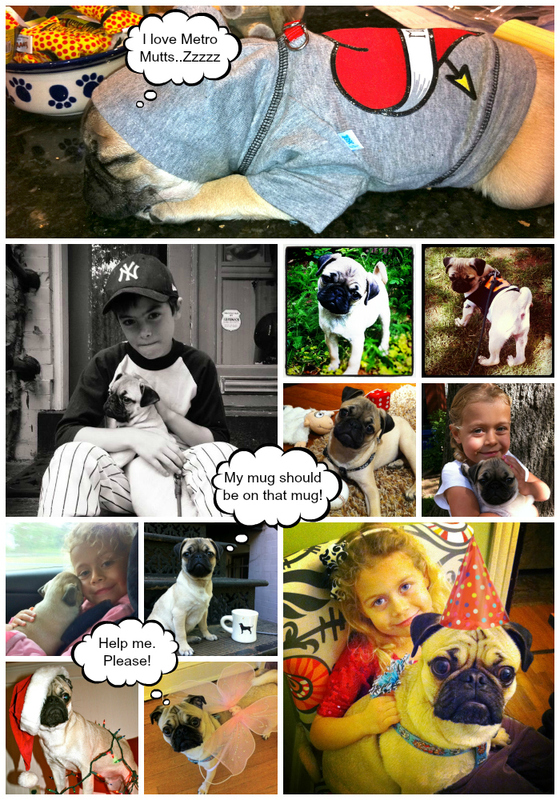 We couldn't let the day go by without celebrating our beloved pup. We hit up our favorite shop, Metro Mutts, and purchased some goodies. Ms. T insisted that Buster needed to have the flower "boutonniere" for his harness (I don't think Buster agrees that tough guys DO wear flowers). I even baked some "pupcakes" (recipe here) for him. I wish I could have captured the shot of him eating his cake. He inhaled it in two bites. The photo montage above is a year in the life of this hyper and pugnacious, but incredibly sweet and lovable, ball of fur (did I mention lots and lots of fur?). It's been a crazy and fun year. I just need to remember to keep my good shoes hidden away. Oh, and Barbie dolls too!